A roof lantern is generally a glazed structure installed on a flat roof, which allows natural light into a room, often referred to as a skylight, however the lantern can also be installed on top of pitched roofs. 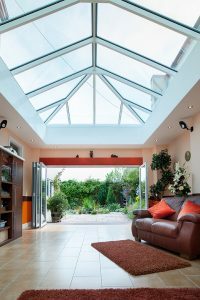 Roof lanterns can be used on existing structures such as Orangeries & Conservatories. 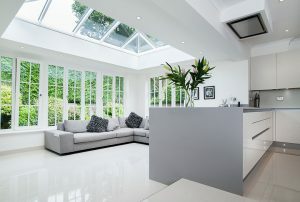 Our range of glass roof lanterns, skylights and rooflights are all designed to let natural light flood in from above, suitable for flat roofs (5 degree to 15 degree slope) Perfect for creating that architectural feel and giving the feeling of extra volume and dimension to any room. Offering unique designs that allow the lantern to be strong but incredibly light, creating a slim but elegant roof profile with excellent thermal performance. These unique designs offers you a greater view of the sky and less roof and frame which brings in more natural to your home in the same space. Available in many sizes and styles, finished in any RAL colour and made-to-measure to your exact specifications. A comprehensive range of glazing is available including clear toughened, anti-sun, easy cleaning and solar control.